A common issue that some might not realize that it is actually very simple to move your forms and data from one JotForm account to another. This guide here is designed to teach you how to do this in a very simple and effortless way so lets get started! There are 2 Easy Ways for you to learn how to Move or Transfer your Forms and Data so we will tell you about each of the three methods below. This is fastest and easiest way to Move or Transfer your Form(s) is to allow us to move them for you. We can move One Form or even All Forms. It can be done in an instant and it also includes your Form Submission Data. (1) Simply Open a New Thread in our Forum telling us you need to Move your Form(s). (5) Once this is completed we will then respond to you to confirm it. Option #2 - Transfer Form Ownership as a Sub-Account User! 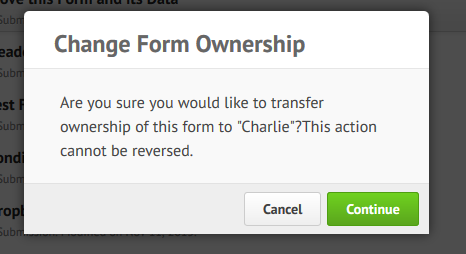 The other way to do this is by Transferring the Ownership of your Form(s) and Submission Data to Move them. This is only available if you happen to be a Sub-Account User or Owner of Forms that are Shared with a Sub-Account User as it works both ways! Please see https://www.jotform.com/help/232-How-to-Share-Forms-with-a-Sub-Account-User to get a better understanding of Sub-Accounts and Sub-Account Owners. (1) Make sure your Second Account is set up as a Sub-Account or vice versa. (2) Log into your First Account with the Form(s) you want to Move. (3) Next, Go to the My Forms page. 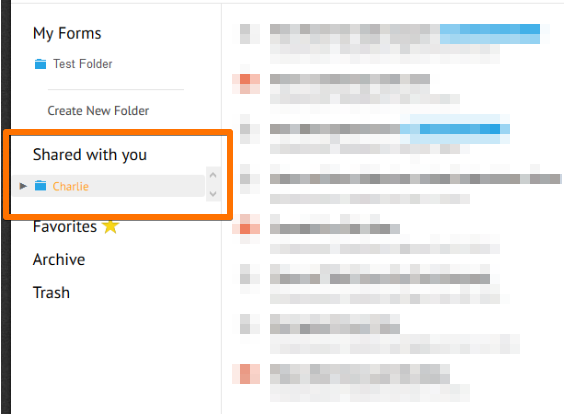 (4) On the left-hand side of your screen, you will see on the left a visible folder labeled Form(s) "Shared with You". 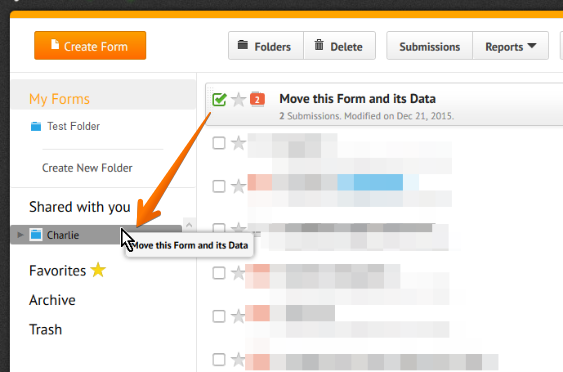 (5) While on your My Forms page with the Forms "Shared with You" displayed you can now Drag'N'Drop your Form(s) from the My Forms list to the right and drag them to the Folder on the left under the Shared with You. (6) Your screen should then go dark and you will receive a Warning Notice asking if you wish to proceed with "Transferring Ownership of your Form(s)" and click "Continue". It will warn you that it is Not Reversible but that just means that you cannot transfer it back from the same account you just sent it from. If you are unsure or still need help just let us know in the comments section below and we can gladly check and help you with this more. I set up the original account under my name and paid for it. Now, the account is still under my name, but is being financed by a corporation. I have a need to set up a totally new account for only myself. Your software always takes me to my present Login page and no matter what I do, I cannot begin a totally new account that is not connected to my present account. What can I do about this? I can use a different User name and a different Email address if necessary. This doesn't appear to work. I click and try to drag the forms on the new owner's side, and I just get a 'no' icon (circle with the slash through the middle). The new owner is a sub account of my account, and I can see the forms on his side in a shared folder, but I can't move them. Please advise. Thank you. If the main account holder of the form that was shared with my account deletes the form on their side would it also delete it on my side too? If I clones that form would it delete the clone too if he deleted that form? I want the data of the form to be send to my mail. All the data, pictures and doc file. Is it possible? if yes then please guide me how? We currently have a sub account for that we use that we also pay for. It seems like everywhere sub accounts are only supposed to be free. My colleague, Monica Black, (user account name: monblack) has tried to make me a sub-user and share files with me. I have followed the advice on the FAQ however when I go to 'my forms' there is no 'shared with me' option in the sidebar. How do I move the unit/apt # field to the same line as the Address Field? Remove address field labels in notification email? Left alignment on a narrow form..